This week, guest poster, Lisa Lucero shares her story of reaching beyond her fear into her faith in Christ. 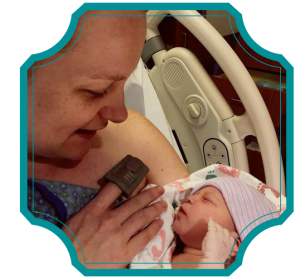 This testimony includes details regarding a birth story. Two beautiful pink lines showed up on my at-home pregnancy test. My husband and I had decided several months before to add to our family. I was ecstatic at the prospect of welcoming our fourth child. Unable to contain my excitement, I packed the test into a gift bag and took it to my husband at his job. We celebrated in the parking lot, laughing and smiling like lunatics. Even though I was probably seven weeks along, my husband planted a kiss on my tummy. Our happiness felt uncontainable, bubbling out of us like a fountain. Heavy, bright red blood. I called my doctor, and they had me come in. They confirmed I miscarried. My husband hadn’t been able to come to the appointment with me, so I cried alone in my car. Losing a child is the most painful thing I’ve ever experienced. Fast forward to July 6th, 2016. There were those two pink lines again. Those results sent me into a spiral of emotions. I felt excited, anxious, thankful, and fear. So much fear. I pleaded with God, please let me hold this baby in my arms. Exactly three days later, I miscarried again. I can’t fully explain all I felt. Blinding rage one day and the next, a terrifying numbness. Shame, depression, inadequacy, denial, sadness, but mostly anger. I was at the lowest of lows in my faith. I felt God had deserted me. Quite frankly, I was so angry that I wanted nothing to do with Him. As I tried to heal from the grief of back-to-back miscarriages, we continued trying to conceive. But it wore on me, emotionally. I felt like such a failure. After successfully carrying three beautiful daughters to full-term, why couldn’t I get pregnant and stay pregnant? Finally, I called a timeout. I needed to focus on getting my heart and mind right. Skip ahead to October 2017. Almost a year later, I was five days late on my cycle. I had a test in the bathroom and thought, what the heck, let’s just see. This time, the actual word “pregnant” showed up on the digital screen of the test. Oh, the wave of emotions that washed over me. Fear was still there, but in my time of healing, I had learned to trust God more. Now, don’t get me wrong, I wish I could say my faith abolished my fear, but I am human. There were days I had great peace. And there were other days I felt like I was drowning in fear. Hearing the baby’s heartbeat for the first time brought me so much relief. When I got that first ultrasound image, I prayed over that picture, giving God all my emotions. I was thirty-eight weeks and five days pregnant. God’s faithfulness and a lot of prayer had carried me through a tumultuous pregnancy. I had been having contractions for a few days, but nothing consistent enough. My goal was to have an unmedicated labor and keep the focus solely on God. I had written down several Bible verses I felt would help me during labor. I had also made a playlist with relaxing worship songs on it. We took a walk to the local park to get my contractions more regular. Just a few minutes into our time at the park, I realized I had to go to the bathroom, so we headed back home. Halfway there, my water broke. About forty minutes later we headed to the hospital, as my contractions had gotten stronger and more consistent. We got there around 1:30pm, and even though I was in physical pain, my joy was intense. About two years after my first miscarriage, I would finally hold my baby. I went to change into my hospital gown and I had just taken my pants off, when bright red blood gushed out of me. Terror gripped me, and I yanked on that emergency cord. The nurses weren’t coming fast enough, so I yelled for my husband. It was a whirl of activity as the nurses hooked the heart monitor up, put an IV into my arm and checked my cervix. Baby’s heart rate was a good 150 bpm and I was dilated to 6 cm. They said the blood was probably from a dramatic change in my cervix. They told me not to worry. As if not worrying is as easy as blinking. I asked my husband to pray for us and then he read my Bible verses I had prepared for labor. I also had my worship songs playing in the background. All those things combined, helped me find peace and focus through my contractions as they got stronger. The doctor wanted me to stay in bed since it was easier to monitor baby’s heart rate. Around 3:45 pm, my contractions started getting extremely painful. I felt like I couldn’t stay in the bed a moment longer. When I was about 8 cm dilated, I asked the nurses if I could stand up for a few minutes. As they helped me to my feet, my nurse tried placing the heart monitor in a better position to hear the baby’s heart. There was a lot of blood up to this point and it was coming out at an alarming rate. They couldn’t find the baby’s heartbeat. I laid back down as the nurse tried again to get a good reading on the baby. When she told Tony to push a red button I knew something was wrong. Nurses and doctors rushed into the room. They put oxygen on me and put an electrode onto baby’s head to get her heart rate. It was back up in the 140’s but each time I had a contraction, it would dramatically dip. My husband, mom and mother-in-law were praying as the doctor asked me if I had any urge to push. I didn’t but I could tell by the look on her face that I needed to. I asked my husband to read me the Bible verses I had, but specifically the ones that spoke about not being afraid and God’s peace. These three verses are the ones I remember bringing me the strength I needed. 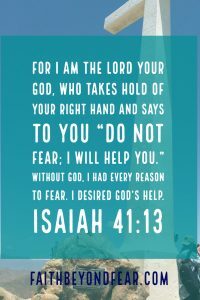 Isaiah 41:13 – For I am the Lord your God, who takes hold of your right hand and says to you “Do not fear; I will help you.” Without God, I had every reason to fear. I desired God’s help. 2 Timothy 1:7 – For God has not given us a spirit of fear, but of power, love and self-discipline. 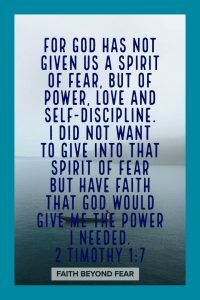 I did not want to give into that spirit of fear but have faith that God would give me the power I needed. 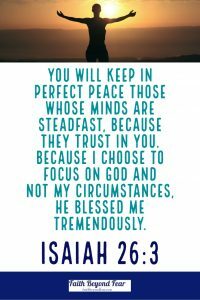 Isaiah 26:3 – You will keep in perfect peace those whose minds are steadfast, because they trust in you. Because I choose to focus on God and not my circumstances, He blessed me tremendously. It became obvious my placenta had started separating from my uterus before it was time, which was why there was so much blood. The problem was once the placenta detaches there is no more oxygen being delivered to baby through the umbilical cord. Even though my body didn’t feel ready to push, I knew I had to try. Pushing took longer than I wanted, and my efforts never felt “right”. But at 4:21 pm, Selah Grace was born. When the doctor lifted her up, she looked wrong. Her body was limp, she wasn’t crying, and the nurses whisked her away from my chest after just a few seconds. Someone called out that she had a heartbeat, then they announced she was moving her arms. My husband said when she took her first breath, “Amazing Grace” by Chris Tomlin was playing. Her first cry was so feeble, but it was a beautiful sound to me. When they finally placed my beautiful baby into my arms, I praised God. What a magnificent God we serve. The Spirit of the living God was in that room and He breathed the breath of life into her. He showed up in such a powerful way, so we call Selah our miracle baby. She recovered unusually well from such a traumatic entrance. Doctors and nurses were amazed. They expected poor motor control, bruising on her chest from the CPR, low APGAR scores, breathing problems and a slew of other issues. She had none of those. 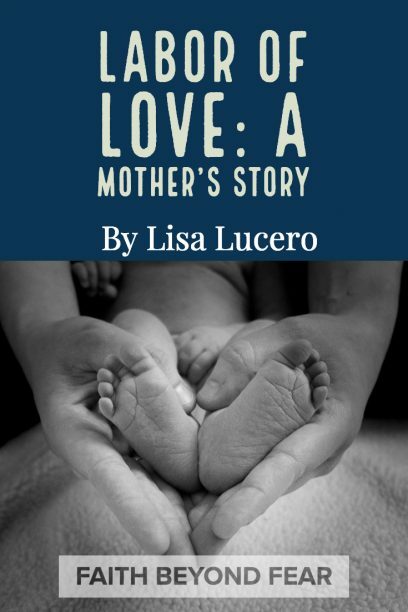 Even my own recovery was something of a miracle, as mothers with a placental abruption can sometimes need blood transfusions, a hysterectomy, or may even die. After two days at the hospital, I left with an extremely healthy baby and a prescription for iron supplements. All I can say is, all glory to God. I believe the prayer, speaking His Word and focusing on Him is what brought about such supernatural healing. Selah Grace was born at 4:21 pm, weighing 6 pounds 15 ounces and measuring 20 inches. Selah means to praise or to pause. Grace means God’s favor. Her name, which we decided on last minute, seems so fitting given the circumstances. We are so incredibly thankful to our Lord for entrusting us with another beautiful daughter. We can’t wait to see how He uses her. Have you experienced the loss of a child? How did God draw you near to Him during that time? Do you have a story when you reached beyond your fear and into your faith in God? Please share your experience in the comment section. God Bless! Lisa is a disciple of Jesus Christ, wife, homeschooling mom to four lovely daughters, and a lover of tacos. She and her husband, Tony, have been married since 2007. Together, they reside in the beautiful state of Colorado with their entourage of girls. You can read more about her & how she is trying to raise godly women by visiting her at www.raisinggodsgirls.com. Don’t Want to Miss a Post? Subscribe! Lisa, I was tearing up as I read your testimony. Thank you for sharing! I am glad you knew to praise your way through this birth, and to have prepared Bible verses. I am happy your Selah Grace came into your family. God is holding the other two babies. They are safe in His arms. Thank you, Diane. God’s timing was perfect with this pregnancy because I don’t think my heart would’ve have worshipped Him if He had given me a baby any sooner than He did. Thank you for sharing your story with us. God bless you and your family. I am glad you enjoyed my testimony. Thank you for the blessing! Such an encouraging, honest testimony! I appreciate your kind words. I hope my testimony encouraged you. Thanks again. God Bless! Wow, Lisa. That’s an incredible story. Thanks for sharing. While my wife and I haven’t lost any children ourselves, we’ve had family and friends go through it. What do you think is the best way for us to support them in those times? We pray, sure, but how do we encourage? Encouragement seems flat and trite. Thanks so much for your words here, and I hope they breathe life for others. Thank you so much for your kind words. Because everyone grieves differently I don’t think there is one right way to encourage someone through a miscarriage. My advice is to let them know you are there for them. Ask them how you can help them through this time and let them know you are praying for them. I did have a friend suggest a book to me that helped me a lot. It is a wonderful devotional titled “Grieving The Child I Never Knew.” I think giving this book as a gift would bless anyone going through the loss of a child. I hope that helps. God Bless!